Registered Bexar County voters can cast ballots at UTSA May 14 - 18. (May 10, 2018) -- The University of Texas at San Antonio (UTSA) is a designated early voting site for the May 22 Bexar County Joint Primary Runoff Election. Any registered Bexar County voter may cast a ballot at UTSA May 14 - 18 in the H-E-B Student Union Bexar Room (HSU 1.102) on the Main Campus. During the primary election, a voter will vote for candidates on either the Republican or Democratic ballot. In Texas, the voter may not vote for both Republicans and Democrats during the Primary. If the voter does not tell the judge whether they wish to vote Democratic or Republican, then the judge will be unable to provide a ballot for the voter. 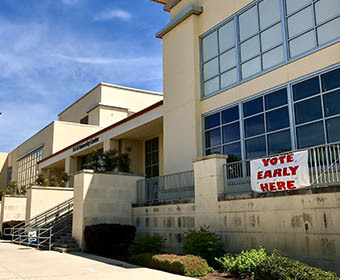 Voters are encouraged to get engaged and bring colleagues, friends and family with them to exercise their right to vote during this early voting period. UTSA officials also invite area residents and those employed at Valero, NuStar, and other local businesses, to use this convenient early voting location. Marked reserved parking will be available for voters on the south side of the H-E-B Student Union. Voters will be asked to present an approved form of photo or secondary identification to vote. On Election Day, May 22, voters must vote at their designated precinct locations. Additional cities in the county are also holding elections. See sample ballots for more details. Learn more about the UTSA Center for Civic Engagement.